Scorching lava can still be seen flowing onto the slopes of Mount Etna, more than one week after the Italian volcano dramatically erupted. 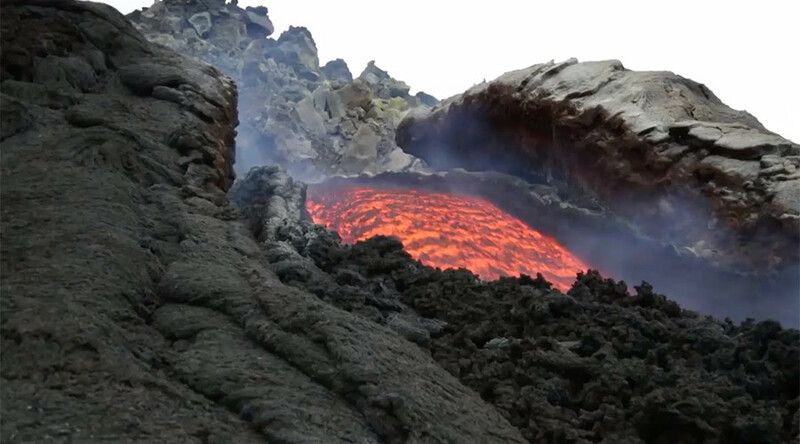 Stunning Ruptly footage shows huge amounts of magma oozing from the 3,329 meter-high mountain. The fast-flowing lava was filmed on Tuesday, seemingly proving that Europe's most active volcano has little desire to settle down after erupting twice in less than one month. Ten people were injured in the latest eruption on March 16, after Mount Etna's flowing magma hit thick snow, causing an explosion which led to rock and other material raining down upon unsuspecting tourists and journalists. The volcano also erupted at the end of February, sending orange lava into Sicily's night sky. Situated between the cities of Messina and Catania, Mount Etna was awarded UNESCO World Heritage status in 2013 due to its near constant state of activity and the scientific and educational value it yields.